It's the Wrong Heri, Gromit! One of the consequences of living in a country with, ahem, lax copyright enforcement is that when a restaurant with a unique name hits on a particularly winning recipe or formula, ripoffs and clones will spring up immediately. For the unsavvy consumer–that is, me–it often becomes impossible to tell them apart, to tell the real ones from the fakes. Examples of this include Ayam Goreng Ny. Suharti, a famous Javanese fried chicken restaurant; Sederhana, the country’s best Padang-style restaurant; and, it turns out, Pondok Sate Pak Heri on Jalan Sabang. I learned this yesterday as I was looking for a quick bite. I had in mind something like fried fish or roasted chicken, and I wanted it to be fast. So I walked over to the local foodstall street and started walking down it. Then I started noticing something. 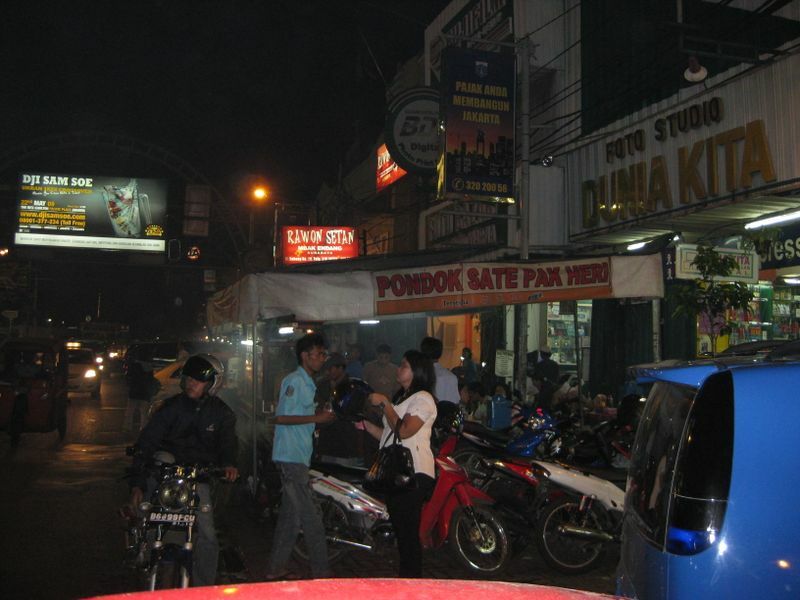 There was another place calling itself Pondok Sate Pak Heri. Hm. Then I saw another one. By my count, there are no less that four different places that block that call themselves the exact same thing and sell the same thing. So how do you know which one is the right one? By how many people were there. Only one Pondok Sate Pak Heri was crushed with people at 7:15 PM, and it was not the one that I went to the second day I was there. So I decided that in the name of fairness to the real Pak Heri, I’d try this one as well. Crushed with motorcycles, with a bunch of people waiting and an oversized grill going out front making a huge smoky haze that extends half a block, this is the place to be. I also notice that almost everyone was ordering the chicken sate. So because of this, and because I’m feeling like I may have eaten enough mutton for an army over the past week, I decided to sacrifice comparability in the name of variety. Also, because I was feeling tired and antisocial, I got my sate to go and ate back in my room. This shows you the customary way to get something “to go” in Indonesia: wrapped in a banana leaf, and then wrapped in butcher paper. 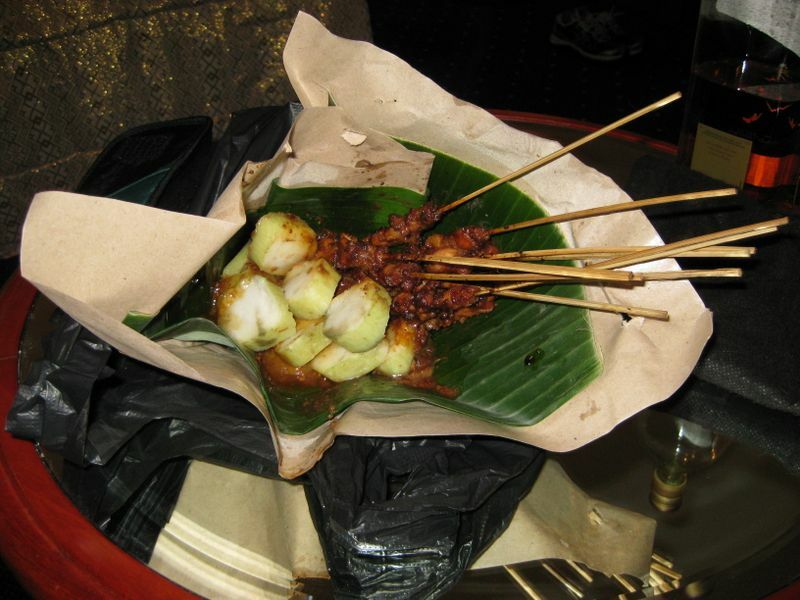 This is chicken sate with steamed pressed rice cakes in banana leaves (lontong) on the side. And the taste? Pretty damn good. My grade: B+. As far as taste goes, these are a winner. Tender dark meat chicken, rich sauce, nice and peanuty and sweet and salty. Just how I like it. The rice cakes are good too, big and tender. But the problem? No acar (the crunchy vinegary vegetables). This is a deal-breaker for me. It makes the dish too rich. More food pictures are up in the food pictures folder, including gado-gado and masakan Padang. Of course now you have to try the other two fake places and tell us if they are any good! I dunno, JMP, I might be full of sate right now! I still haven’t made it down the street to get to Warung Ngalem (the little shack where we had the good black chicken soup) or to Ayam Goreng Ny. Suharti. Priorities, you know? Hey there, I just ate a plate of the fake one you had the other day (in 2009)!! I picked it because your post said it doesn’t have the peanut sauce. And boy it was good! But then I found this post and got a revelation of just how powerful mind inception could be! -anyway,might be useful to post a warning on the other post so reader will know; not all of them have watched The Wrong Trousers! Cheers!